One attendee at the march, which ended at the famous Cable Street mural dedicated to the London East End’s defeat of Oswald Mosely’s blackshirts in 1936, said the turnout was “fantastic” with a “sombre but intense energy.” It was followed by a fundraising gig at DIY Space for London. Two more anti-fascists were arrested in St Petersburg at the end of January 2018 and were also beaten, electrocuted and forced to incriminate themselves by saying they were members of ‘The Network’. A third person was accused in St. Petersburg and two more from Penza have also been arrested for supposed involvement in this make-believe organisation. The FSB claims that the detainees planned to arrange explosions during the presidential elections and the World Cup to “further destabilise the political situation in the country”. After knowledge of the fabricated court cases and horrific torture became widespread, solidarity actions started to take place, but this led to more repression. Some Russian activists who took part were detained, electrocuted and had criminal proceedings started against them– just for expressing solidarity. 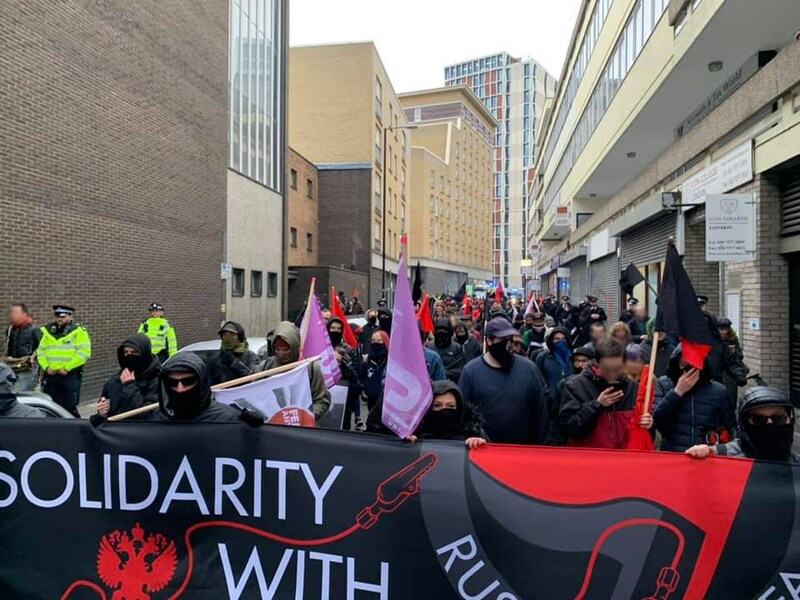 This repression of anti-fascists comes at a time when the Russian state are working with gangs of far-right thugs to repress the whole of civil society. Nikolay Kretov, Igor Yasin, Dmitry Borisenko and Mikhail Komrakov, who were detained on the Anti-Fascist march on January 19th, will spend two nights in the Arbat Department of Internal Affairs on Monday. The police at first illegally detained them on a tip from the provocateur, then punished them with depriving freedom. On Sunday at 1pm a picket will begin at the Arbat Department of Internal Affairs against this outrage. Around a dozen organisations have been involved in the callout, including the Anarchist Federation, Anarchist Communist Group, Brazilian Women Against Fascism, Feminist Fightback and various anti-fascist groups based in London, Brighton and Bristol.